Melbourne’s first new trams in years — and the first Australian-built trams in about twenty years — were officially launched yesterday, after months of testing around the network. The first two “E-class” trams, numbered 6001 and 6002 started service. I managed to catch one for a ride at lunchtime. As you can see from the video, the destination displays look very flickery on camera. They aren’t like that to the human eye — they’re very clear. It’s a problem with LED displays which plagues anybody trying to snap a photo or video of newer public transport vehicles and automated signage. The tram is pretty nice inside. 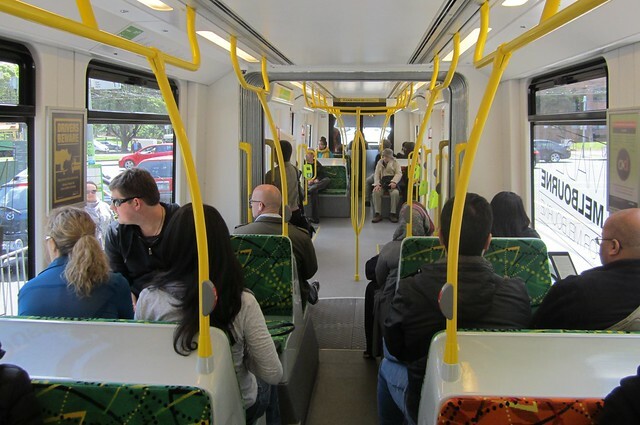 Low-floor trams often suffer from a lack of seating — the Combino D class trams in particular. This wasn’t too bad, with plenty of open space near the doorways, but what seemed like a reasonable number of seats along other sections of the tram. That said, it was off-peak, and everybody who wanted a seat got one. It’ll be a different story in peak hour. 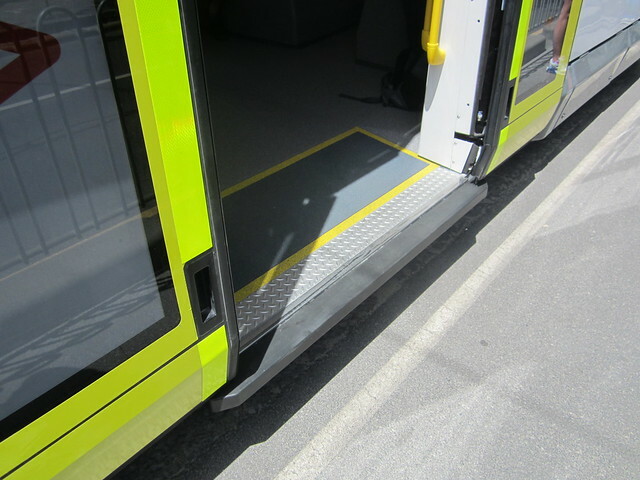 One thing to watch for, especially if you use a wheelchair or a pram, is there is a noticeable slope in the doorway, unlike previous models of tram which are flat at that point. Not a big issue; it’s quite visible. I assume this is so the main part of the floor can be a bit higher. Apparently there is external CCTV to catch motorists who try and illegally overtake trams. It’s unclear how these incidents will be reported, but this is a step forward given it’s such a common and dangerous occurrence. In all, the design looks excellent. One little niggle: the route number has been placed on the left. This doesn’t make sense in a city where at most stops, people wait for their approaching tram on the opposite side — when more than one tram arrives together, it makes it difficult to see which one is yours. 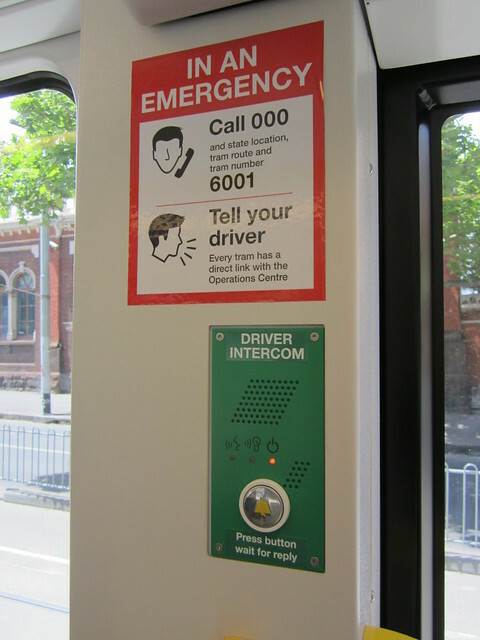 On the older locally-made trams, the route number is on the right, making life easier. If you want to take a ride on the new trams, they’re running on route 96 for now. If you have the Tram Tracker app, you can find them by using the tram-spotter’s feature that lets you search for a tram number: 6001 or 6002. In all, 50 have been ordered, coming into service over the next 5 years. The older low-floor trams will cascade onto other busy routes such as the 86 and the 19 and 59… if they reach the 59, hopefully that’ll mean at last the hospital precinct has an accessible tram service — it’s been a long time coming. Update Thursday: Some observers have noted that the acceleration of the tram from a standing start is a bit too fast, leaving some passengers wobbling around a bit; also that the gap between the tram and the platforms is larger than necessary. Here’s a snap of the latter — it does appear to be less flat and a bigger gap than, say, on Perth’s trains. Next → Next post: PTV unified rebranding – pros, cons, and is it the last ever? It bugs me that the new trams automatically go to #96. Why? Because of hand me downs. If you manage a depot and you’re getting new trams, would you send off your loyal, reliable workhorses to other depots? No, you’d handball the worst stock on to the next depot, making it their problem and hold on to your best trams for dear life. Then there’s the complaints. Passengers, seeing new trams in service, will inevitably confront drivers and complain about the lack of new trams on their line. 96 is the busiest route, of course it is getting the newest and biggest trams. That’s a high level decision being made above anyone at any depot. It’s all part of the massive route96 project. The low floor on these trams has a pretty big gap between the low floor stops, I thought they were supposed to fix this with the new ones? It seems like they were really struggling to get the tram low enough, that slope is very awkward on your ankles and i’m sure they would have tried their best to avoid it. I can’t believe the mistake with the route number has been repeated. Do the designers ever use trams? Great to see these trams in service. As I have always said, there needs to be an early focus in getting two low floor trams in service on each of the three longest routes, mostly to start making use of the high quantity of platform stops on such routes. #75 an #86 being the first two, and there is nothing that would stop YT from having four runs on those routes based at Southbank so they can retain all trams in one fleet in one depot only. Having said that, this order of 50 trams, which is a large order for sure, can only help improve the accessible nature of trams on these two routes, as well as #59 too. Ever since the switch to articulated trams, there’s been no back door on trams, so going behind the last door always feels uncomfortably like getting trapped. It was particularly irksome in some of the newer trams when there was an unused gap where the back door should’ve been, and where a door would’ve been on the original (driving on the right) designs. But am I right in saying that these trams have neither a front door nor a back door, but only middle doors? Why is that? And, am I the only one who feels this way? The 96 gets the biggest trams because it has the highest patronage. It never should have been converted to light rail. That was mainly about stealing the land between Clarendon St and Queensbridge St, where the Casino is now. The main reason that the St Kilda line had patronage low enough, at the time to be converted to light rail is that it was never extended as a railway (it should have been to at least Elwood) and the Victorian Railways Electric Street Railway (railway trams) between St Kilda and Brighton Beach were closed and replaced by private buses between 1955 and 1959. Since the older low-floor trams will filter down to the 86 and other routes, I have to wonder why these routes don’t simply get the new trams – does anyone know the reasoning? The W Class and many of the earlier trams have doors only central doors. The Z class had front and in the Z3s back doors partly because of influences from bus design and partly because of their conductor`s consoles. Institutional inertia then meant that the A and B classes also got this even though the conductor`s consoles were scrapped. Glad to hear the seating is better than the terrible D’s but it wasn’t just quantity lacking there, it was also tiny footroom on the few seats. Hopefully the E class seats have decent space similar to the C’s. Having said that, I use trams rarely because my bicycle is faster to almost anywhere trams go. I never did understand why our trams are so well liked (I agree they are) buttthe hostile conditions for cycling explain why so few people ride a bike. Once the 96 has been filled with the new trams, the rest of the order (probably in the order of 20-30) will go to Preston to run 86 and some 112 (should be 11 by then) services. Although this is a few years in the future so only time will tell. On patronage, I believe 86 actually has the highest, although as people have said, it is a vastly longer route; so route 96 makes sense. I look forward to riding on one of these new trams. I’m glad they are built here in Australia too. The seats defenetly look better in the photo. Besides the hard seats with little legroom and footroom the older low floor trams seem to have a rougher ride than the even older high floor trams. Somtimes these trams (often on Rt. 96) have very loud bearing noise and vibration which the older trams don’t seem to suffer from. I ride a tram nearly every day and indeed they are one of my favorite things about living in Melbourne..
From Daniel’s video above, it appears the E class have the same odd electronic bell sound as the C & D class trams. These electronic speakers that sound the bell noise don’t have the same ability to pierce through the ambient noise of the street. Bring back proper metal gongs to sound the warning bell! I will forever miss the shrill of a real bell when the B-class are eventually retired (being the newest trams in the fleet to have real gongs for their horn). Hope to try these trams soon. Another useful thing is if there are more stop buttons – looks like there are, from your internal shot – when it’s really crowded, it can be hard to get to one so you can get off. Buuuuut the older D’s – which are bloody awful – will be shuffled over to the 19 first, it is stated so that the hospital is accessible by accessible trams… and the nearest accessible stop to the actual hospital is THE OTHER SIDE OF THE HAYMARKET ROUNDABOUT. And there is, seriously, no room to make stop 10 accessible. and make a comment or two. Traders clearly value people driving cars more than people who ride trams. It is my estimation that the Royal Parade and Sydney Rd stops will be converted to stops that allow traffic to drive over the platform with the sections of track currently still allowing cars to drive along the track as well (In Royal Parade that is right turning cars). Stop 10 will probably be first because of the Hospital(s). Hopefully the introduction of larger capacity trams won’t serve as an excuse not to increase frequency where needed. Agree with you 100%. They should not have demolished rail lines to build a bloody Casino! They could have built it atop the rail line like Box Hill Station. 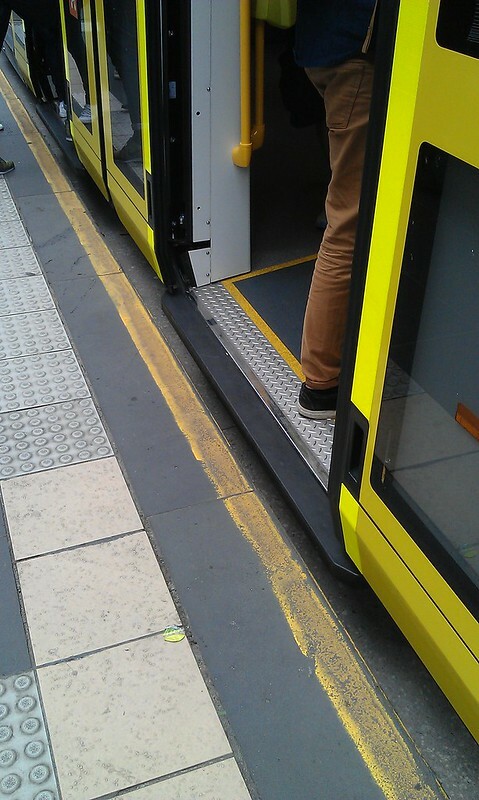 Back to the new tram, there really does need to be a standardisation of how high the floor is off the road. It is fantastic that the world has agreed to common standards on High Speed Rail: standard gauge and 25kV overhead power. If only the world could agree on having a standard distance between the floor of a tram and the road. We do need more technology in our lives. eg, the 2nd photo says to “state the location and route number”. But shouldn’t the 000 operator be able to type in the tram number on a website and see exactly where it is? Weren’t there also plans to redevelop the South Preston tram depot to accommodate the new trams. I haven’t heard anything about that, have you Daniel? does it mean the bigger the tram the less the frequency? 3. Nothing to hang on to. No hanging straps or handles on the backs of seats. The top rail is too high to reach. Due to the jerky ride the people standing are falling everywhere. Very dangerous when packed. Very disappointed after waiting for such a long time. Will be lodging feedback. Having used the new trams on the 96 route now for sometime i agree with Robyn’s comments. It is disappointing when I see an E class tram gliding towards my stop, as while they may have been made in Melbourne surely they weren’t designed here. 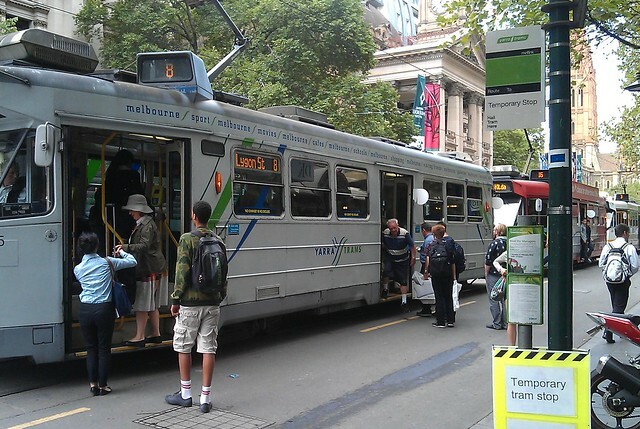 As I could not fathom how a Melboune tram user would design a tram with so many flaws (tram number hard to see, sloping floors making balancing difficult in a crowd, minimal points to hang on effectively, tiny aisles making it difficult to move about, jerky ride, no front and rear doors) that make using it during peak hours, which is most of the day in the CBD and inner suburbs, a frustrating and unpleasant experience.